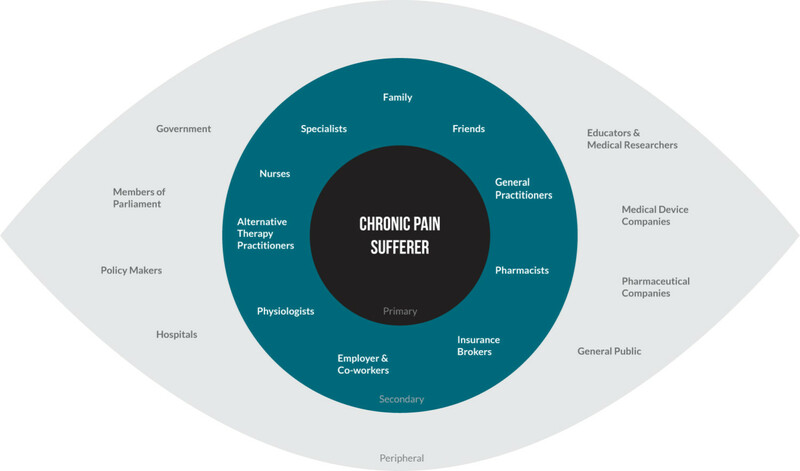 Following the Rotman Designworks Business Design methodology our team developed a strategy to help chronic pain sufferers deal with all aspects of their disease. The project was funded by a medical device company that wanted to better understand its patients and users to serve them better. The project delved deep into user-understanding to get a full picture of what chronic pain sufferers experience. Once we assessed our research we brainstormed ideas and prototyped solutions. After much testing and user evaluation the final solution was integrated into a business strategy for our client. Below is a summary of our process and results. Our team was made up of four MBAs and two designers. We all conducted user interviews and collectively developed our solutions. I am the designer of all the assets shown here including personas, maps, icons and infographics. I used the data gathered by our team to create these visuals. 1. Develop a holistic pain management solution that meets the emotional, mental and physical needs of chronic pain sufferers. 2. Enable our client to better understand the needs of chronic pain sufferers and foster the development of value-added solutions for them. The goal of this phase was to develop a comprehensive picture of the patient and their needs. Initial research was undertaken to better understand the complex problems of neuropathic chronic pain. Medical professionals and our client’s staff who work with pain sufferers were interviewed. We looked to medical journals and publications to get a complete picture of the patient experience as understood by the leading researchers. This project focused on neuropathic chronic pain sufferers. This type of pain is caused by damage to the nerves which transmit messages of pain to the brain. The pain can be caused by obvious sensory events or without stimuli. When pain occurs over a long period the way pain messages are processed by the brain can be effected often making the pain worse . The result is a frustrating and difficult to treat chronic pain. Patients not only suffer physically but emotionally and socially. We interviewed primary and secondary stakeholders including: patients, family members, nurses, doctors and advocacy groups. Patients and family members were asked to create photo journals which were the basis for our in-person interviews. Open-ended questioning and empathetic listening encouraged subjects to speak from the heart about their experiences with chronic pain. The interviews were recorded and documented. This component was key to the rest of our process. We broke down the interviews into quotes, categorized and then grouped them. This allowed us to visualize the reoccurring themes and discover the challenges that chronic pain sufferers face. These patterns were analyzed in spreadsheets to quantify the data and rank frequency. To better understand what pain sufferers deal with we put ourselves in their shoes. We enacted scenarios to create physically uncomfortable situations and role played interactions to get insight into patients’ thoughts, feelings, frustrations and limitations. This eye-opening experience led to greater empathy and understanding. 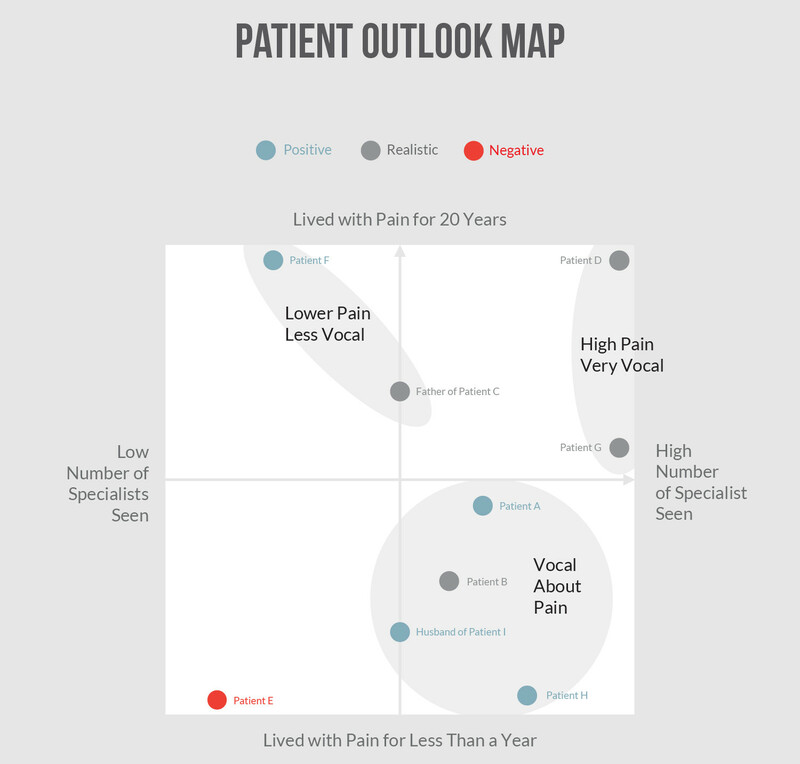 From the interviews we created maps of the patient flow. This allowed us to quickly visualize the variety of tests and medical professionals they might encounter while being diagnosed and treated. It also highlighted the lengthy process for most patients. We plotted the number of years our interview subjects had been living with pain against the number of specialist they had seen to understand if their was a correlation between their experience and the outlook they had on their pain. The patients who most advocated for their health were the ones who had lived with pain for less than ten years and had seen a higher number of specialists. Defining the patient needs from our data clusters was a main component of the project. These needs were key to the rest our process by providing a guideline in which to judge our solutions. We continually compared our concepts to these needs to ensure we were addressing the real problem. These unmet needs in turn identified opportunities for our client. We developed multiple personas that could represent the varied characteristics of our research subjects. This allowed us to humanize our solutions as we developed them always referring back to how our personas would engage, react and feel through all stages of their experience. The goal of this phase was to quickly develop ideas and test them until they became a refined solution. We brainstormed how we could meet the needs defined in our first phase. 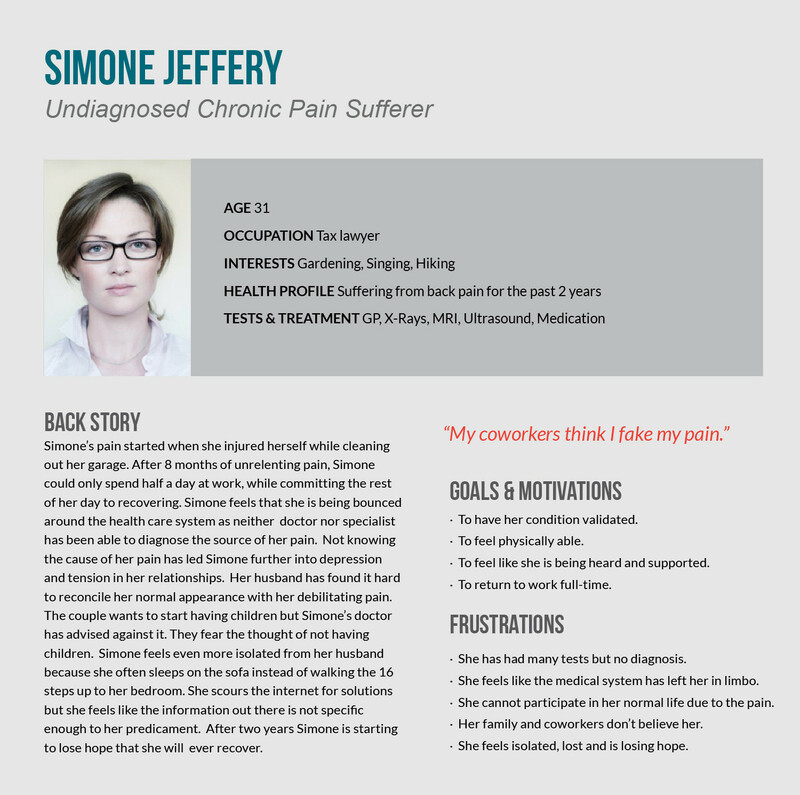 Asking questions like “How can we make people believe Simone is suffering from Chronic Pain” allowed us to work through the frustrations of each of our personas. We broke these solutions down into categories of solutions including people, objects, services, systems and environments. As concepts developed we enacted the solutions from our personas perspectives to identify what worked and what didn’t. This was an iterative process to allow for open dialogue and refinement. One concept that evolved was allowing data to affirm the patients pain. This would solve their need to be believed. 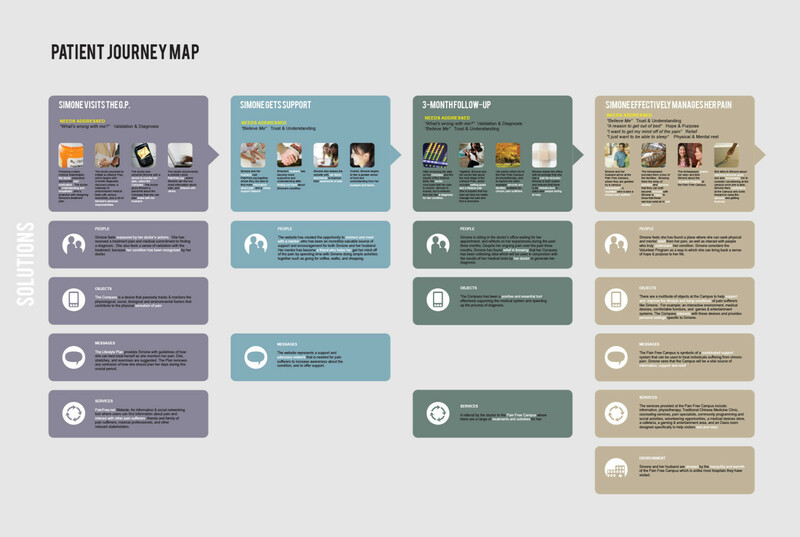 Journey mapping provided a detailed picture of the current patient experience from initial pain to living pain free. It allowed us to plan our solution around an ideal patient experience removing frustrations along the way. As solutions developed we sought feedback from pain sufferers to quickly identify what could be changed or improved upon. This allowed for feedback before a final solution was proposed to our client. By creating value for the consumer and in this case chronic pain sufferers, we developed business opportunities for our client. Our client focused on the needs of chronic pain sufferers only during their treatment phase. The proposed solution shifts the focus of pain management from treatment to a comprehensive system that includes prevention, diagnosis and treatment. By developing a diagnostic device, the compass, our client becomes a trusted source from the beginning of the patient journey. Providing patients with a lifestyle plan again reinforces patient trust and is in line with their current activities in patient treatment. In the long-run, greater value can be derived by expanding the scope of the system to include early detection and potentially prevention of chronic pain as well as increase awareness of the condition. 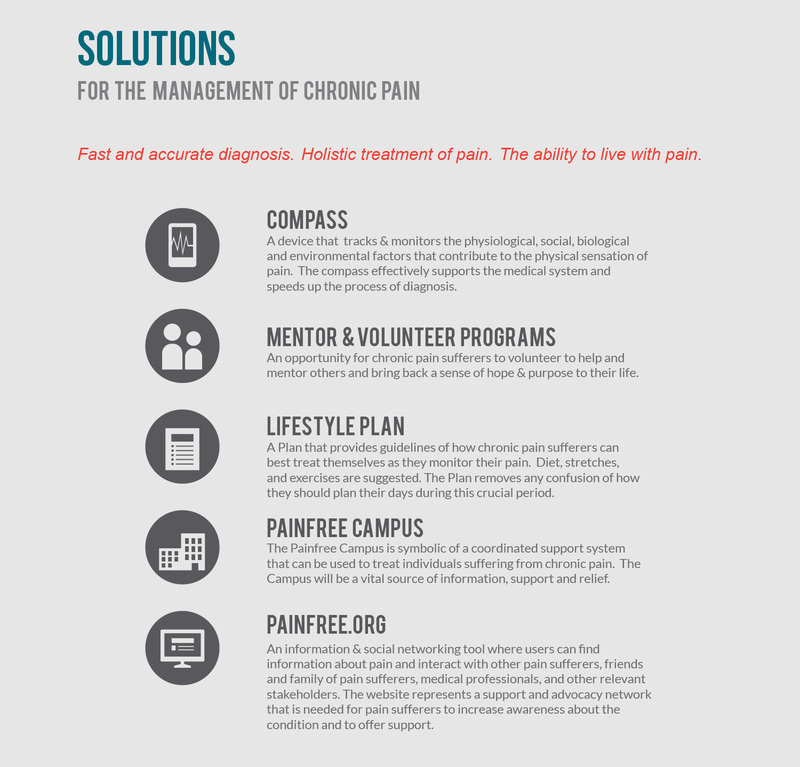 This can be done by implementing the complementary parts of the solution, such as the website (painfree.org), the campus, and the mentorship program. 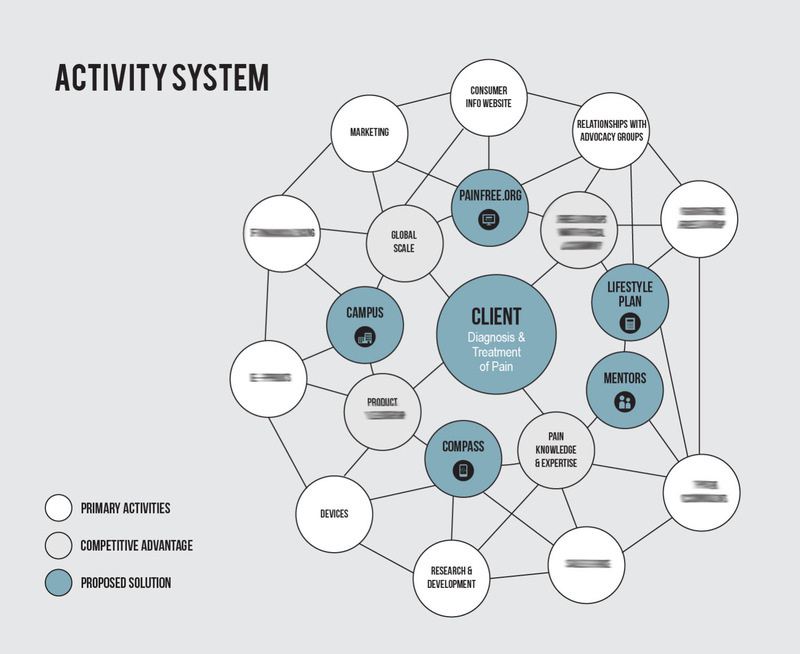 The activity system highlights the solution integrated into our client’s overall business context. The implementation of the solution is dependent on the unique position of the client and their relationships within the community and the core drivers of their business. Our solution is contextualized within the activity system to reinforce how it viably fits in with the clients current strategic objectives and creates competitive advantage. It leverages current activities to show how the solution can succeed. The comprehensive solution addressed all of the identified target users’ needs while adding value to all other stakeholders. This solution harmoniously integrates with the clients strategy and activities and if implemented in its entirety, has the potential to generate a long-term sustainable competitive advantage. Our solution allows the client to integrate chronic pain prevention and awareness into its core focus of pain treatment and diagnosis. The information presented here has been summarized and edited to protect patient and client confidentiality.